Hi all! 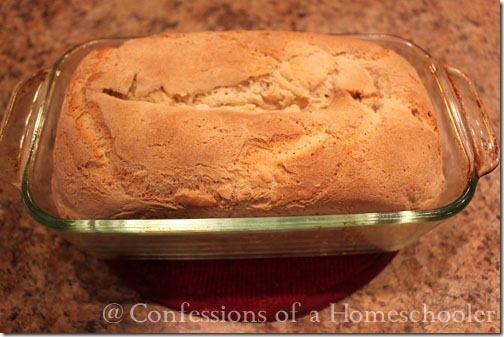 Today I wanted to share a recipe with you that we’re loving over here at Confessions! 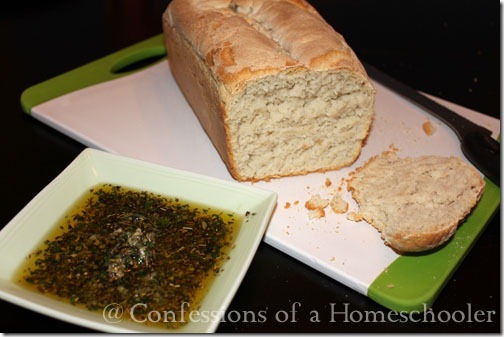 It’s the Carrabba’s Bread and Dipping Sauce Recipe! Okay, so I’m sure it’s not the “official” recipe, but it’s as close as we could get and tastes pretty good if I do say so myself! Now before you read on, I just want to say this isn’t one of those ‘mill your own wheat’ and ‘no bad stuff in this’ recipes. The bread at Carrabba’s is white bread, and so this recipe uses white flour, and yes…Crisco. So I know it’s not all that healthy in regards to nutrition, but at least it’s homemade and so that counts for something right? So ready to get on with all the yummy goodness? 1. Dissolve the yeast and a pinch of sugar in the 1 1/2 Tbsp. of Luke warm water. After 5-10 minutes you will see the yeast start to activate by bubbling and foaming. Substitution: You can also use instant yeast, add 1 tsp. 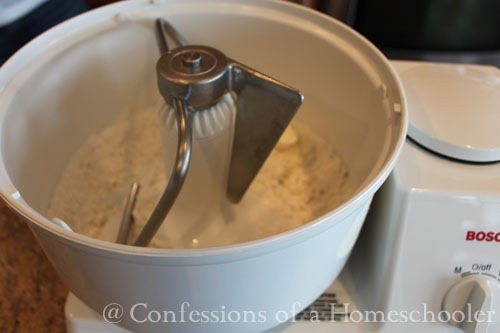 of dry instant yeast to the dry flour. And increase the amount of water by 1 1/2 Tbsp. in the next step. 2. 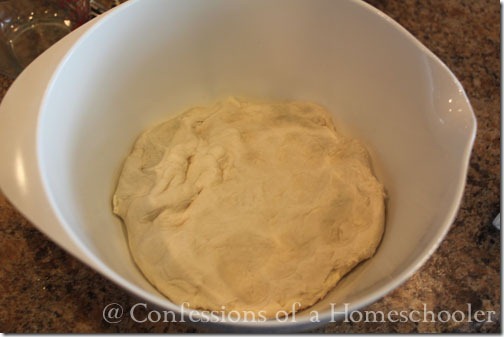 Put 1 cup of flour in a large bowl and add the yeast mixture. Start mixing and gradually incorporate the salt and shortening. 3. Add remaining flour and and remaining 1 1/4 cup of water slowly. As the mixture starts to absorb the water, continue adding the remaining water until a ball of dough forms. You can do this part by hand, or in your Bosch mixer if you have one, that’s what we use and LOVE LOVE LOVE it! If the dough is too wet, knead in an extra tablespoon at a time of flour until the dough is ‘tacky’. Be careful not to add too much flour, it will be a more sticky dough. 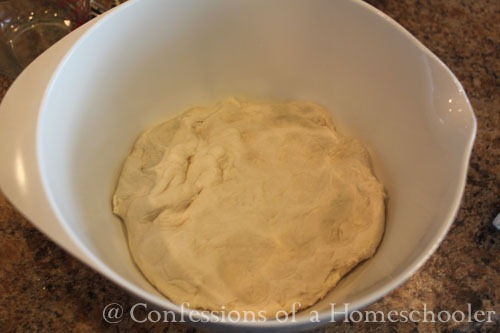 Basically you want to add enough flour to make it so you can handle the dough, but it will still be difficult and sticking to your fingers quite a bit. Look at my Bosch go! 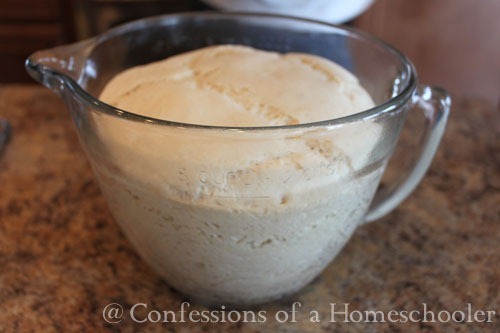 Knead dough in mixer or by hand for about 4 minutes until a nice smooth ball forms. Tip: A good tip to aid in the rising process is to pre-heat your oven to 150 or 200 degrees, whatever is the lowest temp your oven allows, then turn off the oven and place the bowl in there to rise. Make sure to cover it with a kitchen towel so it doesn’t get dried out. The warm air helps it rise a bit faster. Remove dough from the bowl and knead again by hand or mixer for about 4 minutes. 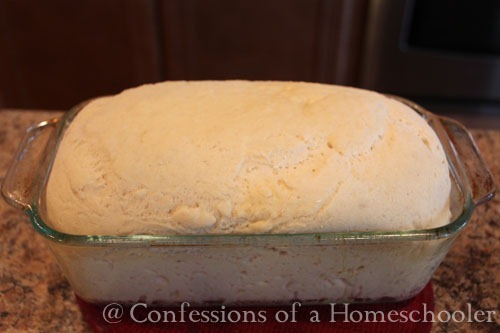 Place it in an 8×5 or 9×5 greased loaf pan and lightly oil the top of the dough.. Cover with plastic wrap or kitchen towel and let dough rise a second time for about another hour or until doubled again. Next pre-heat the oven to 450 degrees F. Once loaf has risen the second time, remove the plastic wrap and using a sharp knife, make a slight slice down the loaf length wise across the top. Bake at 450 degrees F for 15 minutes (Do not open the oven door during this time), then reduce oven temperature to 350 degrees F, and bake another 30 – 40 minutes or until top of loaf is a light golden color. Remove from oven and let cool for about 10 minutes, then transfer to a cooling rack, or cutting board. Serve warm with Italian dipping sauce! Mix all above ingredients together and store mixture in refrigerator until ready to eat. Serve in small dipping bowl. 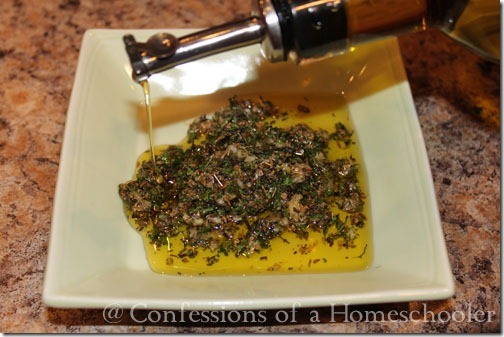 Add more olive oil to spice mixture as desired for a wonderful Italian dipping sauce! Leave a comment! Let me know if you try this and how it worked for you! I love this dipping sauce, it’s so tasty and the bread will have a nice hard crust but be soft and chewy inside just like at Carrabba’s! Enjoy! This looks amazing! I have been looking for a bread recipe using all-purpose flour instead of bread flour. I made a new pasta sauce recipe last night, so this will go perfectly with our dinner. And not all recipes have to be super-healthy – some are just for fun! I have some sort of bran allergy so I can’t tolerate whole wheat or oats – so I have to eat the “unhealthy” kind. So this recipe is perfect for me. I am totally going to try the dipping sauce. That’s my favorite. I wish I could get my bread to look that nice. 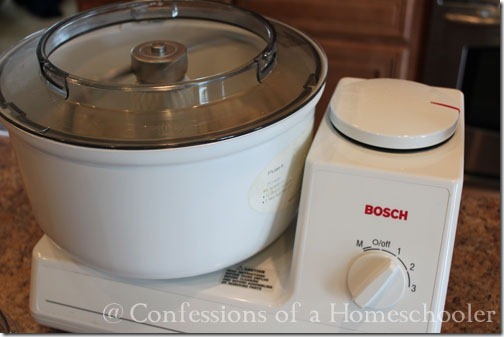 I’m a newbie at baking bread and it just doesn’t turn out… How much does a machine like that cost? It depends on where you purchase, they can be anywhere from $200-$400ish. If you can find a used Bosch it’s worth it! This does look very yummy! Thanks for the heads up on some of the ingredients….I may try replacing Crisco with coconut oil! I may be missing it, but how much sugar? Thanks by the way, this looks yummy! Just made this- used a pinch of sugar to activate the yeast. Turned out perfect! 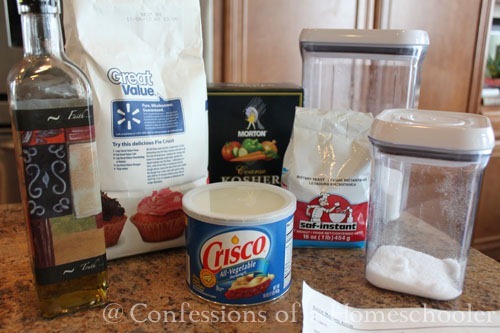 I am making this today and in the recipe you are missing how much sugar and the directions call for mixing the yeast in the 1 1/2 tbsp of water, but you never say when to add the 1 1/4cup of water to the mixture. I am going to wing it and see what happens. Can you correct? I really want a good bread recipe. Sorry, it’s just a pinch of sugar to activate the yeast. And I’ve updated the recipe with the remaining water. Sorry about that! You should never have to apologize for posting something you enjoy. Thanks for the recipe! Oh YUM!!! Can’t wait to try this. Often the bread at restaurants is my favorite part! Please post how much sugar is needed! I can’t wait to try this! Sorry, it’s been updated, see above!